Ullysses Threatt, Sr. was born December 20, 1933 to the parentage of the late Luches and Elsie Threatt in Sylacauga, Alabama. 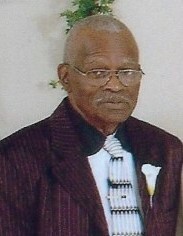 Ullysses Threatt, Sr. confessed his life to Christ at an early age at Pleasant Hill Baptist Church in Sylacauga, Alabama. He later joined Pine Grove Baptist Church, where he attended faithfully until his death. He was a faithful member, where he served on the Deacon Board for over fifty years, and on the finance committee for many years. He worked at Southern Alloy for 42 years. Ullysses Threatt, Sr. united in Holy Matrimony to Dorothy Mae Pope on December 18, 1954. To this union nine children were born. He was preceded in death by his loving wife, Dorothy Mae Threatt; his parents, Luches and Elsie Threatt; his brothers, Jesse, Gloss, William, Stanley and Lincoln Threatt; and one sister, Bertha Burney. He leaves to cherish his memories ten loving children, Eunice Parham, Vanessa (Joe) Garrett, Ulysses (Marion) Threatt, Jr., Jacqueline (Julius) Twymon, Veronica (Michael) Turner, Thomas (Loretta) Threatt, Patsy (Myron) Kelley, Lesa (Norman) McNealey, Edwin (Marsha) Threatt, and Tracy Threatt; also to cherish his memories one adopted son, Dontavious Threatt; one Godson, William Wheeler; siblings, Larry (Mary) Threatt, Sr., Billy (Arletha) Threatt, Carolyn (Roy) Harvey; four sister in laws, Louise Threatt, Gloria Threatt, Nellie (Otis) Jenkins, and Cornelia Cook; one brother in law, James Pope; twenty-seven grandchildren, forty-three great grandchildren, one great-great grandson; and a host of nieces, nephews, other relatives and many friends. A special friend, Deacon Marty Funderburg.